Mirin (Water, Dextrose, Rice, Corn Syrup, Salt), Lite Soy Sauce (Water, Wheat, Soybeans, Salt, Alcohol, Vinegar, Lactic Acid), Sake Rice Wine, Sugar. 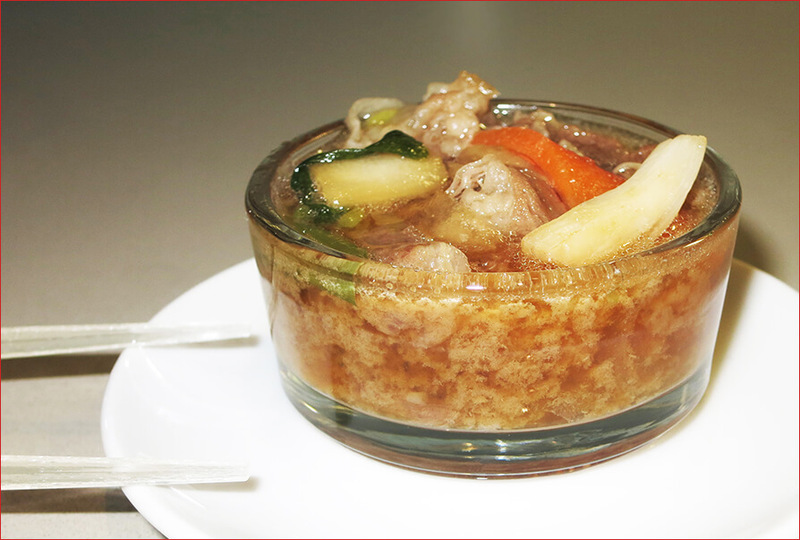 Place both sukiyaki pouches and sauce packet in the refrigerator to defrost for 2 hours. Preheat skillet over medium heat; add sauce packet and contents of both pouches to skillet and stir for 7 to 8 minutes or until fully cooked. Serve right away. 2 hours of defrost time is a lot to ask – it kind of negates the benefit of a frozen meal. We found that placing the pouches in warm water for 20-30 minutes defrosted them enough to speed up the process considerable. We love Japanese food. The careful preparation and simple, yet flavorful sauces always please our palate, and the meal is always a fun experience. So when we saw this Japanese-style frozen dish from TJ’s, we had to give it a try. Unfortunately, we ran into a few critical issues. First off, the instructions call for defrosting the ingredients for 2 hours. No typo – 2 hours. Seems a bit flawed from the start – if we had time and foresight to prepare 2 hours ahead, we probably wouldn’t be eating a frozen dinner. Next up, we noted that the dish looked pretty unappetizing when cooking. Something about the fatty, stringy meat gave a hint that we might not like the final result. As for the portion size, we’re not sure how this dish is classified as 4 servings. Perhaps if it’s a hint of an appetizer, it could work for 4 people, but we barely portioned out 2 servings (and, truthfully, only one of us ended up eating it – after the other didn’t want to finish – and it still wasn’t enough food). Further, the vegetables were oddly chewy, and the meat was overly fatty and at the same time too thin to be enjoyable. As noted above, it was a little stringy too. On the plus side, the sauce was sweet tasting and pleasant, and the noodles were surprisingly tasty. Sadly, that wasn’t enough to save this dish, and we’re going to steer clear on our future shopping trips. 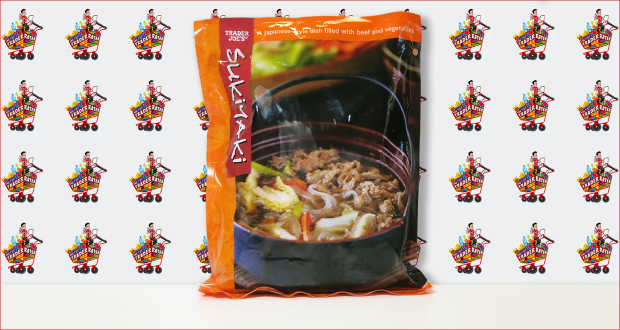 Have you tried this Trader Joe’s Sukiyaki dish? If so, what did you think? Did you know this item’s thin plastic packaging is recyclable? You can’t recycle it with traditional plastic containers, but you can drop it off at most grocery and retail stores – including Trader Joe’s. Click to learn more about recycling plastic bags and wrapping. Summary : Skimpy portions and preparation time aside, we were disappointed by this frozen dinner's fatty, stringy beef and oddly chewy veggies. I found the meat (in mine at least) to be finely marbled and tasty…but not nearly enough of it. And…noodles? Where were they? I must’ve missed them for all of the ONIONS! I mean, seriously, was this onion sukiyaki? I’m not even certain there were any other vegetables present. Furthermore, the onions were obviously cut far too near the peel – they were tough, chewy, and overall unpleasant. I think I may have seen some cabbage in the mix somewhere, though I can’t be certain, and the whole thing was very watery. I had to cook it down. As for the taste? WAY too sugary. It was more like a sweet teriyaki…and an onion teriyaki at that. 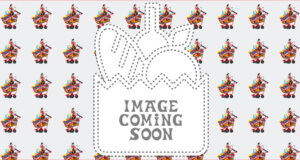 Definitely going to pass on this one – this would make even an amateur Japanese cook cry with embarrassment. Ha ha – thanks for sharing your experience! Interesting that the quality/cut of your beef sounds significantly more appealing than ours was. There’s definitely room for better QC/more consistency on this product. Glad to hear you’re in agreement that this dish didn’t make the cut! It is frozen for long storage. Please do not review it as a microwave ready instant ramen noodle dish. If cooked properly, the texture and taste are excellent. There is simply nothing like it in stores except if you go to specialty Asian food markets. With such low price it is a great alternative. Also, if we eat it on top of rice, four servings are possible with four cups of rice. Please don’t pull it off the shelves. Thanks for your feedback, Vlad! We don’t use a microwave for any of the products that we review, so we agree with you on that for sure. Maybe we’ll have to give it another test in the future based on your recommendation. We keep seeing this item in good stock at our local Trader Joe’s, so it seems like it’s sticking around! Thanks again!